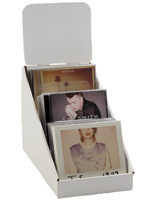 The CD Rack is Great for Placement at Checkout Counters for Impulse Buys. The Music Display is Able to Hole DVDs too. 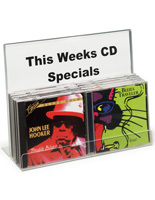 The CD Rack Will Hold a 5 x 7 Sign to Display Additional Information to Customers. Acrylic pocket will hold no more than 5 CDs. Display has a built-in holder for signage that brings attention to highlighted items. Tiny footprint of holder is great size for cash wraps! 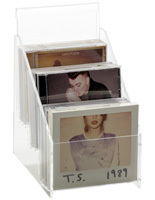 The CD rack that is made of acrylic holds no more than 5 CDs. The plastic fixture has a 5" x 7" area for placement of a graphic. 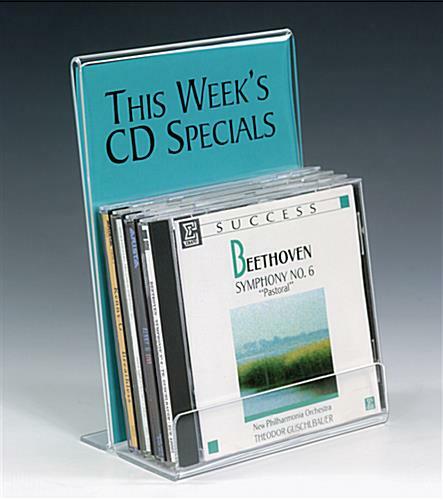 The CD rack, called a music display, has an unobstructed view of its backer that measures 2.25" high x 5" wide. Just print your information on a 5" x 7" sheet of paper and place it into the holder. The DVD display, CD rack has a sign that makes a total return, so the entire 5" x 7" sheet is trapped inside. It's easy to create your own messages with word processing software. 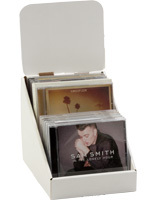 This CD rack is ideal for commercial environments. 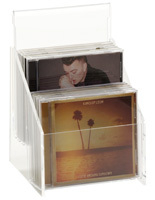 The acrylic holder will help tempt those last minute impulse buys from customers. 5.6" x 7.1" x 2.3"